01-025.2DF Stage 2 Dual Friction Clutch Kit: AMC AMX Javelin, Jeep Cherokee CJ Wagoneer - 11 in. 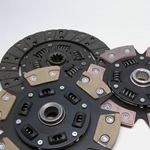 01-025.3C Stage 3 Ceramic Clutch Kit: AMC AMX Javelin, Jeep Cherokee CJ Wagoneer - 11 in. 01-026.2DF Stage 2 Dual Friction Clutch Kit: AMC AMX Javelin, Jeep CJ DJ J Series Jeepster - 10-1/2 in. 01-026.3C Stage 3 Ceramic Clutch Kit: AMC AMX Javelin, Jeep CJ DJ J Series Jeepster - 10-1/2 in. 01-033 Clutch Kit: Jeep Cherokee Comanche Wagoneer Wrangler 2.5L - 9-1/8 in. 01-033.2DF Stage 2 Dual Friction Clutch Kit: Jeep Cherokee Comanche Wagoneer Wrangler 2.5L - 9-1/8 in. 01-034 Clutch Kit: Jeep Cherokee Comanche Wagoneer Wrangler - 10-1/2 in. 01-034.2DF Stage 2 Dual Friction Clutch Kit: Jeep Cherokee Comanche Wagoneer Wrangler - 10-1/2 in. 01-034.2K Stage 2 Full Kevlar Clutch Kit: Jeep Cherokee Comanche Wagoneer Wrangler - 10-1/2 in. 01-034.3C Stage 3 Ceramic Clutch Kit: Jeep Cherokee Comanche Wagoneer Wrangler - 10-1/2 in. 01-035 Clutch Kit: Jeep Cherokee Comanche Wagoneer Wrangler - 10-1/2 in.